Motor and fan specialist ebm-papst is putting considerable effort into developing the potential of its products. After establishing itself in the market, the RadiPac series of centrifugal fans is now expanding, with new models in sizes from 630 to 1,000 (Fig. 1). Thanks to a number of aerodynamic improvements, all of the fans in this series work with a wide optimum efficiency range and also feature other practical characteristics. With drive power from 500 watts to 12 kilowatts and sizes from 250 to 1,000, air performance of up to 40,000 m³/h can now be achieved. Figure 1: Having established itself in the market, the RadiPac series of centrifugal fans is adding new models again. With drive power from 500 watts to 12 kilowatts and sizes from 250 to 1,000, air performance of up to 40,000 m³/h can now be achieved. The efficiency of the motors is already well above the values called for by the IE4 efficiency class. But greater motor efficiency is no guarantee of an equally high overall system efficiency. Besides its motor, a fan’s impeller, its housing and even its conditions of installation have to be considered when analyzing the energy situation, if all potential for saving energy is really to be realized. With this goal in mind, the engineers at ebm-papst have performed a complete aerodynamic optimization of the RadiPac fans, focusing on the air inlet, the motor’s position in the impeller, the blade profile and the impeller air channel. They designed the inlet ring for the impeller and its aerodynamically optimized blade channel. And they adjusted the motor’s position in the impeller to achieve a good compromise between compactness of the complete fan unit and the most aerodynamically beneficial location for the motor in the impeller. Figure 2: Starting with size 310, the impellers have the new airfoil aluminum blades for improved efficiency. The flow diagram at the right shows the pressure distribution; low pressure is shown in blue and high pressure in red. The airfoil aluminum blades in the impellers result in greater efficiency (Fig. 2). The RadiPac Airfoil impeller is now both lighter and stiffer. They achieved a further reduction in the pressure losses at the inlet and also improved the outflow characteristics with the trailing edge and the integrated radial diffusor. This reduces the deflection and pressure losses when the fan is installed in an air conditioner (Fig. 3). They also thought about practical ways to transport and install the fans. Sizes 630 and larger feature a stackable cubic design with clear installation benefits for the user, safety during transport, and less packaging waste. They can also be flexibly mounted with horizontal or vertical motor shaft. The design makes it possible to isolate the fan from its surroundings with rubber isolators in order to ensure even quieter operation. Figure 3: Deflection and pressure losses are reduced when the optimized fans are installed in air conditioners. An optional guide profile set for simple installation of centrifugal modules with support structure and spring elements is still available. There are no grounds to fear flow losses thanks to the special design of the cube struts. Depending on the conditions of installation, the centrifugal fans are also available with the proven support brackets (Fig. 4). Measures increased the efficiency of the RadiPac fans by more than 13% over that of the previous models. Taken together, all these measures increased the efficiency of the RadiPac fans by more than 13 % over that of the previous models. In addition, a wide optimum efficiency range with static overall efficiency of 68 % enables the fans to work with minimum power consumption at practically every operating point. There are also no unpleasant surprises when it comes to noise (Fig. 5). Figure 4: Sizes 630 and larger feature a cubic design. 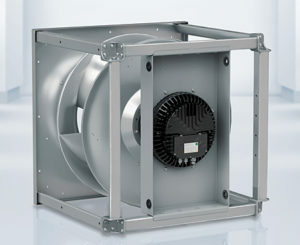 Depending on the conditions of installation, the centrifugal fans are also available with the proven support brackets. The planned operating point for a system may shift due to changes in the ductwork, for example. Another reason to change the original operating points could be gradual clogging of the filters in the AHU equipment. Essential for the RadiPac’s wide optimum efficiency range is the ideal interplay of all fan components. With their high efficiency, simple handling and small footprints, these medium-pressure centrifugal fans excel in many ventilation and air conditioning applications. Generally speaking one can say that when several EC fans are operated in parallel, active PFC (power factor correction) can protect against unwanted harmonics. PFC converts the pulsed input current of the EC motors into a sinusoidal current, which is then shifted so that it is in phase with the voltage. This greatly reduces the harmonic content of the power supply, enabling the relevant requirements of EN 61000-3-2 to be satisfied without design modifications. It also minimizes the peak input current values and in many applications, users can select a smaller cross-section cable for the fans’ power lines. 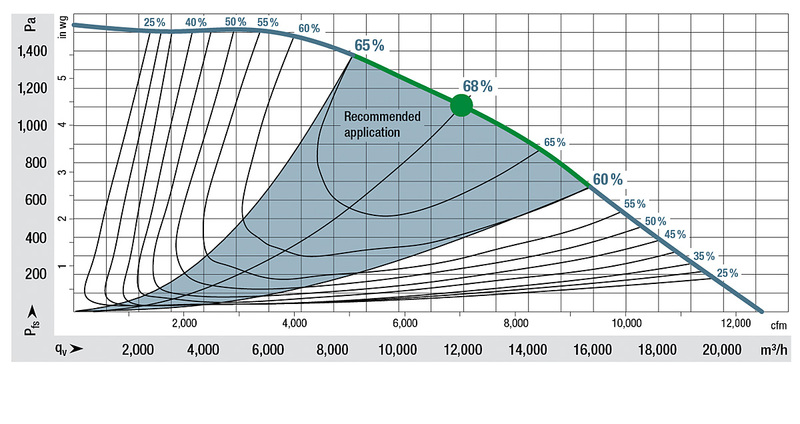 Figure 5: The wide optimum efficiency range with static overall efficiency of up to 68 % enables the fans to work with minimum power consumption at practically every operating point and prevents unpleasant noise-related surprises. Practical experience has repeatedly shown that in fans, modern EC drives are considerably more energy-efficient than the conventional AC drives that are still frequently used in ventilation and air conditioning equipment. Regulations such as Germany’s “Energiesparverordnung” (energy conservation regulation, abbreviated “EnEV”) and the ErP Directive (Energy-related Products Directive) have also done their part to increase the popularity of EC technology. Commissioning RadiPac fans with GreenTech EC technology is simple because neither expensive fine-tuning nor additional grounding and shielding measures are required since the control electronics and EC motors are perfectly matched. With the smoothly adjustable speed control typical of EC motors, the fan power can also be precisely adjusted to satisfy individual needs, with communication via the 0-10 V input or MODBUS RTU.